Bullard, the newly named Northeast Fisheries Administrator, recently announced that he is circumventing the process set out by the Marine Mammal Protection Act to reduce by-catch (incidental death) of harbor porpoise. Prior to Bullard’s August appointment, the National Marine Fisheries Service (NMFS) issued a letter to fishermen in the spring outlining that target catch rates of harbor porpoise had been exceeded and compliance with pinger use was low. The notice further went on to indicate that, as a result, fishing area closures would go into effect on October 1. However, in September, Bullard stated that he will overturn the predetermined and required consequence area closure for the western Gulf of Maine. The intent of the closure was to reduce takes of harbor porpoise in areas of known high interaction if fishermen did not comply with pinger usage, as mandated by the plan. While Bullard acknowledged that fishermen could have avoided the proposed closure by effectively using pingers, and that the abundance of harbor porpoise are in decline, he has decided to undermine the plan. Beginning in 1999, fishing gear modifications, including the use of pingers went into effect, to enable the fishery to operate and reduce the fatal interactions with harbor porpoise. Pingers are sound emitting devices strung along the nets, and their use has proven to reduce interactions with harbor porpoise without disturbing the catch rate of target fish. According to NMFS, the Coastal Gulf of Maine pinger compliance level between September 2010 and May 2011, the most recent data analyzed, was only 41%. Fishing without pingers in required areas is a violation of federal law. As early as 2006, NMFS scheduled multiple outreach training sessions to improve pinger usage and compliance by gillnet fishermen. 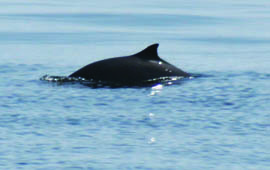 It was during the 2007 meeting of the Harbor Porpoise Take Reduction Team (HPTRT), which included WDCS and members of the gillnet fishing industry, the Team agreed, by consensus, to incorporate into the Take Reduction Plan what were called “consequence areas” as incentives to improve pinger use and compliance. These consequence areas were based on seasonal locations where NMFS data showed high takes of harbor porpoises. Harbor porpoise, a protected species, have long been known to be caught and suffocate in gillnets, a type of fishing gear that sets a string of nearly invisible nets along the ocean floor. Pingers served as a workable solution to the rising number of by-caught porpoises. Bullard’s decision comes after NMFS has found compliance with pinger requirements to be abysmal and that the bycatch rate of harbor porpoise in the proposed Coastal Gulf of Maine Consequence Closure area was more than twice what would be considered acceptable in a two-year span. While NMFS has said that modifying this plan will benefit harbor porpoise, they have provided no data to the Take Reduction Team or means to enforce pinger compliance.